Using this coupon code to get 15% OFF for our most luxurious nephrite jade eggs set at our amazon store. You can give this coupon code to your friend. 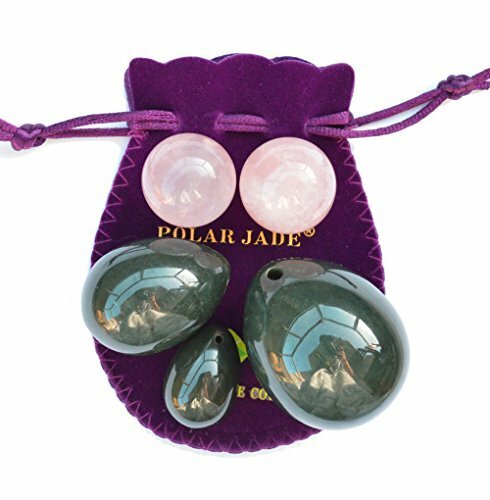 Product: Genuine nephrite jade eggs 3-pcs set will full size range (L, M and S) and pair of rose quartz Ben Wa balls bundle. Great gift for yourself or your loved one. Coaches, trainers, educators, and individual practitioners of Kegel exercises and jade egg practices, you are at the right place. We make jade eggs, yoni eggs made of 100% natural and genuine nephrite jade, rose quartz and obsidian. Our products are shipped from the US or Canada depending on your destination address. All of our jade eggs come with certificates of authenticity. We are based in Vancouver, Canada, only 50 minutes to Vancouver international airport. If you are in greater Vancouver area, you are welcome to stop by at our office. 9 out of 10 of the "jade eggs" on the market are fake jade eggs made of variants of translucent marble stones such as serpentine. Serpentine is often used as jade simulant in China and is often marketed as "water jade", "new jade", "xiuyan jade", "xiuyu jade", "serpentine jade", "nephrite serpentine jade", or just "jade eggs" without mentioning the actual stone name. Serpentine is a soft and loose marble stone. Some serpentine stones, particulaly those light green serpentine stones, usually will de-color (changing color) when contacting with moisture and air. This de-coloring is called "zuosui" in Chinese and is a well-known phenomenon in fake jade products made of serpentine. The de-coloring is caused by the reactions of the soft and loose serpentine marble stone with moisture in the presence of air. While there is no scientific data yet to prove the serpentine is hazardous, we strongly suggest you do NOT buy or use your light green serpentine eggs. Considering the intimate usage, any stone that de-colors over time is NOT suitable for yoni eggs. We have the BEST yoni eggs made of real nephrite jade eggs. Nephrite is one of the 2 true jade" (another true jade is jadeite). The "jade eggs" used in Taoist practice in ancient time in China were nephrite jade eggs. True nephrite jade is considered the "Stone of Heaven". Because of its healing power, hardness, toughness, and densely compacted mineral structure, nephrite jade is the best choice as yoni eggs. Nephrite jade egg is heavier than fake jade eggs so it is very easy to tell the difference. 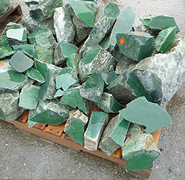 Below are pictures of rough nephrite jade in green. 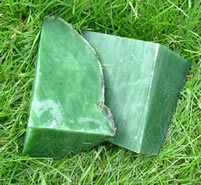 Please note nephrite jade also comes in white (the most expensive one), dark gree, black, brown, yellow etc. depending on trace amount of iron, copper and other mineral inclusions. We use mostly dark green or black nephrite jade to make yoni eggs for better integrity and uniformity considering the intimate usage. With our nephrite jade processing facilities in South China, we have the capability of designing and processing jade eggs, yoni eggs, yoni wands with any size and drilling pattern. Nephrite green jade is the most popular jade gemstone with powerful healing properties. For details about real nephrite jade eggs, please click yoni eggs (jage eggs), all carved from 100% natural green nephrite jade. Please browse the stunning jade products in this site to select the ones for yourself or to give as amazing gifts.